The Titan Safety Squat Olympic Bar is the safe way to max out your squats and progress your workout to more weight. The padded shoulder and arm pads increase your comfort level at higher weights. In addition, the bent bar lowers the weight plates to stabilize your center of gravity. 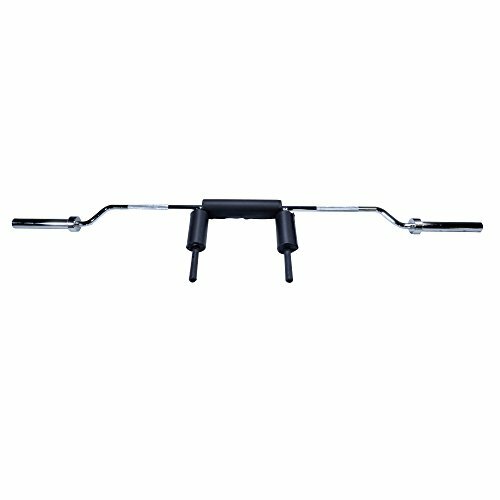 Hand grips allow you to control the bar during the lift and keeps you in control. Fits 2" Olympic Plates. - Shoulder and arm pads for a comfortable lift. - 4" drop keeps the weight plates lower for a stabilized center of gravity and better balance. - 6" hand grips for control when needed. - Loadable sleeve length: 11"
- Overall sleeve length: 12.5"